Focaccia is a soft olive oil-soaked bread that comes from Italy and more commonly, from Tuscany in the northwest part of the country, where it is also known as schiacciata. There are many variations of the focaccia—some puffed up like a sponge cake, others as flat as pancakes. A traditional loaf should be light and airy with a soft crumb. It should never be dense and will rarely rise when cooked beyond 2 to 3 inches. 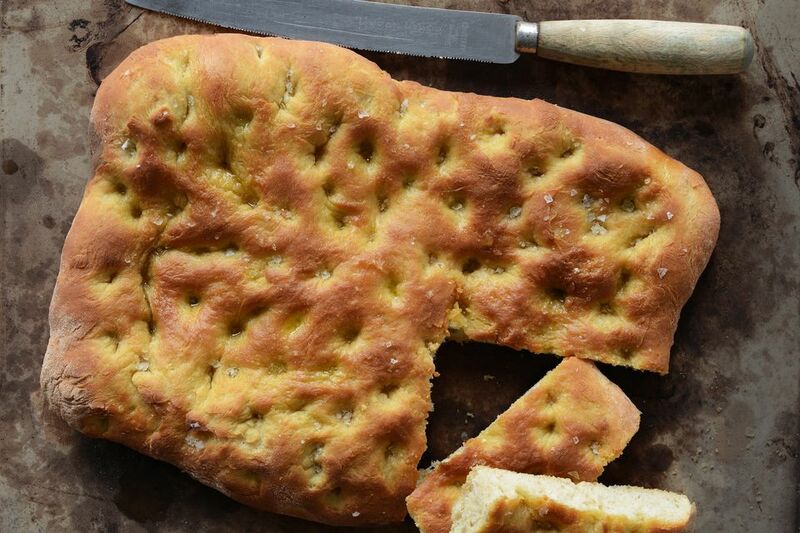 The classic topping for focaccia is a heavy drizzle of good quality olive oil and a sprinkling of sea salt. However, in recent times there have been more and more different flavored toppings. Focaccia is best eaten on the day it is made. At few days old, it can be used in recipes such as panzanella (a Tuscan summer salad, but good at any time of year) or used for bruschetta. Place the flour, salt, yeast, 1 tablespoon of the olive oil, and the water into a stand mixer with a dough hook. Slowly mix the ingredients to form a sticky dough. Continue to mix for 4 to 5 minutes, adding more water if the dough feels dry. Sprinkle the dough with the remaining tablespoon of oil and mix for another few minutes to create a smooth, glossy dough. Cover and leave to rise in a warm, but not hot place until doubled in size. Remove the dough from the bowl. Lay onto a baking sheet lined with parchment paper and lightly flatten into a rectangle, which is the traditional shape. You can also make your focaccia round if you wish. Leave to prove in a warm, but not hot place for another hour. Lightly press your fingertips into the dough, then drizzle with the olive oil, making sure the indentations are filled. Sprinkle all over with the sea salt. Bake for 20 minutes. The bread is cooked when golden brown, risen and hollow when gently tapped on the base. Leave to cool on a rack and eat as soon as possible as focaccia is always best on the day it is made. Wrap tightly in greaseproof paper and pop the bread into an airtight box if not eating immediately. Rosemary: Sprinkle roughly chopped rosemary needles—do not use the woody stalk—along with the olive oil. Sage: Lay finely-shredded fresh sage leaves onto the bread and sprinkle with olive oil. Blue Cheese: Crumble the cheese (Gorgonzola is traditional) over the risen dough. Sprinkle with the oil then bake. Black Olive: Place pitted black olives into the indentations (if the olives are too big, then cut in half). Sprinkle with oil, then bake. Onion: This is a delicious topping that's traditional, but well worth a try. Thinly slice 2 medium onions. Place them in a bowl of cold, lightly-salted water and leave to stand while you make the dough. Heat 2 tablespoons of olive oil in a frying pan. Drain the onions and dry thoroughly on kitchen paper, then gently sauté until the onions are cooked but not too soft. Place the risen dough on a baking sheet, make the indentations and then spread the cooked onion mixture. Brush with the oil and bake as directed.